PEDIGREE MARROBONE® now comes in a tasty Bacon & Cheese flavour that your dog will love. 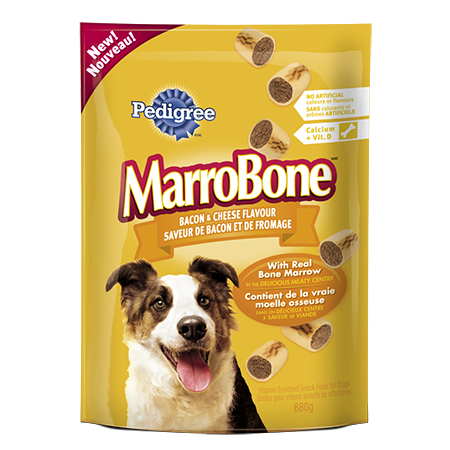 PEDIGREE MARROBONE® treats are a great reward and a very nutritious treat, packed with the delicious goodness of real bone marrow wrapped in a crunchy biscuit. Each scrumptious treat contains no artificial colours or flavours and is enriched with Calcium, Vitamins A, D and E. An irresistible treat to help your dog stay happy and healthy for life. PEDIGREE MARROBONE® Vitamin Enriched Treats for Adult Dogs in Bacon & Cheese Flavour is rated 4.5 out of 5 by 51. Rated 5 out of 5 by THOMASCON_333524294 from My dog was very excited to try this product as I was opening the bag. I gave her one and she asked for more with her eyes before she had finished the first piece. She has not been a picky eater but she definitely likes this product. The portion size per piece is appropriate as I can feed her more than one at a time without providing too much at any one time and she looks forward to another serving at another time during the day. Rated 4 out of 5 by AMBERLISON_333632122 from Our two dogs both enjoyed these treats a lot.. Our American Bulldog will eat anything. Our Boston Terrier is a bit more fussy but she enjoyed it as well! I'm glad Pedigree is on the right track with no artificial colours or flavours, adding vitamins, etc.. but I still think the ingredient list needs a bit of work. A lot of pets are on restricted diets due to weight, allergies, etc.. Rated 5 out of 5 by PAMELAAON_333497853 from My dog is a fussy snacker, and he can sniff out when products contain a lot of filler. For this reason, he turns down a lot of snack/treat products on the market today for dogs. However, he loved these meaty morsels! We are doing some training right now, and these were perfect for a reward snack! Rated 5 out of 5 by MIDORIDBC_333510582 from to be honest my dogs eats any type of treat so it's hard to tell what is actually good or not but as far as I see it they get super excited everytime i open the bag and enjoys it very much. I was surprised the size of sample you gave us. it was not a small bag! very generous thank you very much. Rated 5 out of 5 by LEAHTAB_333632293 from My dog really liked this treat! My only criticism is the ziplock closure on the bag - it is very flimsy, and broke the second time we opened it. I just put the product in my own resealable bag, so not a big issue - just something that can possibly be improved in the future! Rated 4 out of 5 by Nova from My dog LOVES these!! I got these from a neighbor actually whos dog didnt like them. My dog absolutely LOVES these treats. Bacon and cheese flavor is the icing on the cake. My dog hates the Dentabone but loves these. I will most definitely be buying these from now on!! Rated 5 out of 5 by JASMINECNL_333505033 from The product was fresh and both my small and large sized dogs loved it! There were no issues with them chewing and consuming the treat and they seem to prefer it over other treats I have at home. Great product! Not suitable for puppies or dogs under 25 lbs (11.3 kg). WHEAT FLOUR, MEAT & BONE MEAL, SUGAR, NATURAL FLAVOUR, ANIMAL FAT (PRESERVED WITH BHA/BHT), CALCIUM CARBONATE, COOKED BONE MARROW, MALTED BARLEY, SALT, NATURAL SMOKE FLAVOUR, NATURAL BACON FLAVOUR, VITAMINS (VITAMIN SUPPLEMENTS (A, B12, D3, E), d-CALCIUM PANTOTHENATE, NIACIN, RIBOFLAVIN (VITAMIN B2), PYRIDOXINE HYDROCHLORIDE (VITAMIN B6), THIAMINE MONONITRATE (VITAMIN B1), FOLIC ACID), CHEESE POWDER, TURMERIC, SODIUM METABISULFITE (A PRESERVATIVE), CARAMEL, IRON OXIDE.